Every year April 17 marks Palestinian Prisoners’ Day in the hope of bringing attention to the plight of the thousands of Palestinians languishing in Israeli jails. This year’s focus is on ending the use of administrative detention which is widely regarded as a punitive measure employed by Israel to detain and silence Palestinians. It stands as a huge barrier to any sustainable solution to the question of Palestine and betrays the brutal nature of the Israeli colonial occupation of Palestinian land. 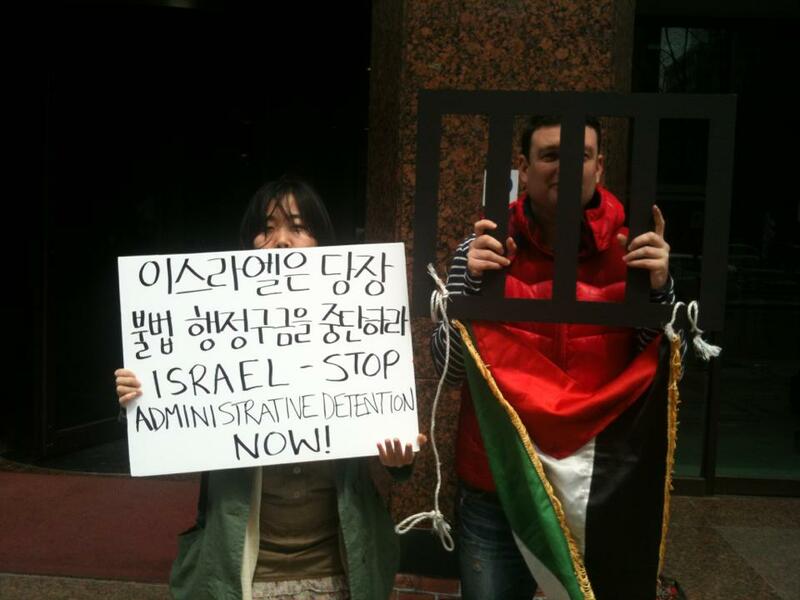 Palestine Peace & Solidarity activist in front of the Israeli Embassy, Seoul on April 16. Since Israel’s occupation of Gaza, East Jerusalem and the West Bank in 1967 an estimated 800,000 Palestinians have been detained under military order. This amounts to some 40 percent of the entire male population of the occupied territories being detained. There were some 4,600 Palestinians in Israeli prisons including 169 in administrative detention as of February this year. Most have been forcibly transferred from the occupied Palestinian territories to prisons located in Israel in violation of international law. It is estimated that 204 Palestinian prisoners have died while in Israeli custody since 1967 and human rights organizations have alleged that doctors have at times colluded in torture of those in custody. The practice of administrative detention is routinely used by Israel to imprison Palestinians –who the Israeli Security Agency (ISA) refers to as “security prisoners” – without charge for up to six months at a time. As detention orders can and often are renewed, detainees can potentially be held indefinitely. 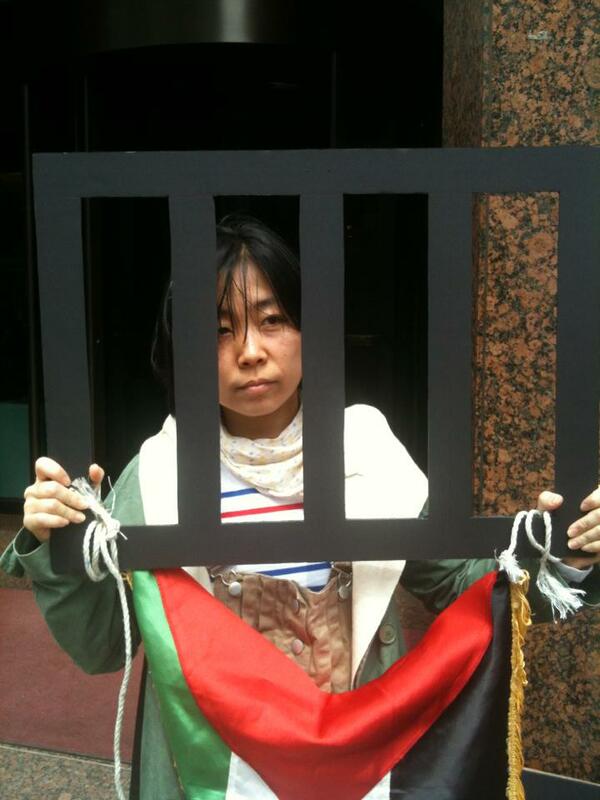 The use of administrative detention has been widely condemned by human rights organizations around the world. Essentially, it is a process that denies judicial accountability by preventing access to detainees to proper legal recourse and therefore is an effective way to silence and punish Palestinians in the occupied territories determined to be a “threat” to “public security”. Israel uses Military Order 1651, the Emergency Powers (Detention) Law and the Internment of Unlawful Combatants Law to hold Palestinian administrative detainees in three prisons, two of which are located inside Israel. Alleging to have been in a perpetual “state of emergency” since 1948, Israel uses administrative detention as a form of collective punishment to arrest and silence Palestinians exercising their basic civil and political rights to criticize the Israeli occupation. Palestinian prisoners’ rights organization Addameer points out that the simple act of holding a Palestinian flag or pouring a cup of coffee to a member of an organization deemed illegal by Israel is possible grounds for one’s arrest under the Israeli military occupation. 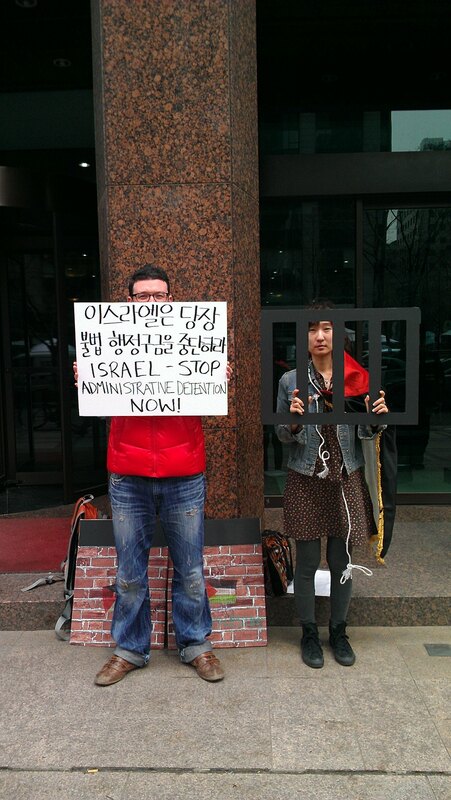 PPS activists in front of the Israeli Embassy, Seoul on April 16. Detainees are routinely detained without knowledge of the reason for their arrest, which is rarely disclosed by military judges, and a number of their rights are violated once in detention such as having to endure poor prison conditions, inadequate medical care and denial of family visits. Furthermore, Amnesty International reports that Israel’s use of administrative detention is likely more often than not accompanied by forms of torture or cruel and degrading practices for which Israel has exercised with “complete impunity” for more than a decade. The UN Committee Against Torture reported in 2001 and again in 2009 that the practice of administrative detention itself as used by Israel did not conform to the prohibition against torture which is absolute. It has also long been well known that the ISA which oversees the prison system used to hold Palestinians routinely employs the practice of torture against detainees. Israeli human rights organization B’tselem lists the specific techniques used by the ISA in interrogations as including sleep deprivation, exposure to loud music and extreme temperatures, placing dirty sacks over interrogees’ heads, forcing interrogees into stress positions, violent shaking and food deprivation – usually used in combination. Less well known is that Israel runs a secret prison facility known as ‘Camp 1391’ in an undisclosed location 100 kilometers from Jerusalem as revealed in 2002. Unlike Guantanamo Bay, which it is regularly compared to, the International Committee of the Red Cross has not been granted access to this facility to assess the treatment of its prisoners. While there is no way to confirm whether or not this facility remains in use, testimony from former prisoners indicates that torture and physical abuse were commonplace. Looking at the case of administrative detainee Sameer Issawi throws a lot of this into relief. Having been arrested for the first time at age 17, he was arrested again during the second intifada and sentenced to 30 years imprisonment. After being released 10 years later in the 2011 prisoner swap negotiated between Israel and Hamas in which 1,027 Palestinians prisoners and detainees were exchanged for the release of Israeli soldier Gilad Shalit, he found himself rearrested by the IDF on July 7 of 2012 for supposedly violating the terms of his release. He is one of the many prisoners released in the prisoner swap who have since been since rearrested under questionable circumstances. With one brother already killed by the IDF in 1994 at the age of 16, Assawi’s remaining five siblings have served prison terms including one brother who is currently serving his nineteenth year. His family members including his elderly mother face constant harassment. To protest his arrest he has been on hunger strike since August of 2012 and is apparently very close to losing his life. While the hunger strike has consistently proven to be a useful strategy for detainees to bring international attention to their case and in pressuring the Israeli authorities into making a deal for their release, it can also lead to further deprivation and punishment at the hands of the prison authorities who sometimes place them in solitary confinement, deny family visitation rights and slap fines on them. But it is a powerful act of defiance for those with few options left like Assawi. It was recently reported that his whole village has joined a hunger strike in solidarity with him. Last year’s Prisoners’ Day was marked by some 1,600 Palestinian prisoners launching a hunger strike in Israeli jails. This Prisoners’ Day it is time for the international community to call for an end to the practice of administrative detention by Israel and to demand the release all of those like Sameer Assawi who are not formally charged and given a fair trial. Putting an end to this reprehensible practice will constitute a small but important step towards achieving justice for those living under Israeli military occupation.